A showing of powerful mezzotints by San Francisco artist James Groleau will be highlighted at an Amador 1st Saturday Art trek reception on August 4th from 4 - 7pm at the Hanford St. Gallery in Sutter Creek. The eleven images that make up the body of work titled "Gates of Rochefort" are not editioned prints, but one-of-a-kind pieces. Depictions of various French architectural elements were first rendered in mezzotint, then cut up and sewn together to form two-dimensional structures. The structures were then hand-stitched onto property deeds from Rochefort, France. Materials include mezzotint, thread, glue, charcoal and antique deeds dating to 1836. The exhibit will also include some of Groleau's darker, psychological works from two additional series of works. The"Absence of Passion" is a suite of fifteen mezzotint portraits reflecting the trauma of warfare. "Blood Bone Elegy" is a suite of eighteen color mezzotints depicting the outbreak of war. Images were achieved through the use of white and black inks printed on orange hand-made paper, the color paper serving as the median tones. His popular Salt Granite Spruce landscape series will remain available for viewing as well. Groleau taught himself the difficult mezzotint printmaking technique and has become a modern master at it. He is the recipient of numerous awards, grants, and fellowships, including a MacDowell Colony fellowship in 2001. His work is included in the collections of the Achenbach Foundation for Graphic Arts, Fine Arts Museums of San Francisco; Portland Museum of Art, Portland, ME; Cleveland Museum of Art, Cleveland, OH; Oakland Museum of California; National Museum of Fine Art, Antwerp, Belgium; and the Janet Turner Print Museum, Chico, CA. He divides his time between San Francisco and coastal Maine. The show will run from August 2nd through August 26. Hanford St. Gallery is located at 291 Hanford St., Old Hwy 49 (next to the Days Inn), in Sutter Creek, Ca and is open Thu/Fri/Sat 10 - 5 and Sunday 11 -4:30. For more information call 209-267-8074 or email hanfordstgallery@volcano.net. Wicked Sister are at Roaring Camp again for the Saturday night BBQ on August 11, please make reservation soon as seats on the truck into camp are limited. 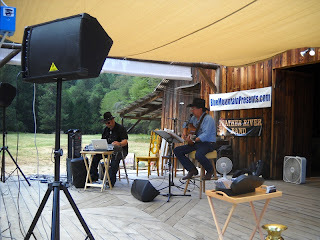 Gold panning, swimming in the river, music from the Wicked Sisters and of course are GREAT NY Steak BBQ. Call for reservations. Jackson, CA (July 25, 2012) – After a successful run, Main Street Theatre Works (MSTW) has sent the Jersey crew from The Taming of the Shrew back to the east coast, and is saddling up for their next summer show, The Majestic Kid, by Mark Medoff, running Friday and Saturday nights, August 10th thru September 8th. Doors open at 6:30 for picnics, show starts at 8:00. Patrons are encouraged to come early with their picnics, chairs and jackets. The Kennedy Mine Amphitheatre is located on North Main Street in Jackson, next to the Country Squire Motel. Please note that this play contains some adult language and content. Dean Shellenberger directs a solid cast in The Majestic Kid, the story that follows the adventures of Aaron (Matthew Moore, making his MSTW debut), as a well-intended environmental lawyer, and his live-in sidekick, and law partner, Ava Jean/A.J. (played by an MSTW favorite, Dale Lisa Flint). They’ve come to help the Apache’s recover their sacred land but soon find out that intentions aren’t always reality, both in business and one’s personal life. Aaron falls for Lisa (Amanda Goldrick, also new to the MSTW stage), the love interest of Judge Finley (Amador resident Marty Brifman, last seen as Baptista in The Taming of the Shrew), who’s also got an interest in the Apache land. As life gets complicated and the going gets tough, Aaron calls on his matinee film idol, the Laredo Kid (played by veteran actor Allen Pontes, last seen as Petruchio in The Taming of the Shrew). Laredo steps out from the silver screen and into Aaron’s world as a sort of guide; to teach Aaron how to become the Majestic Kid, and to handle his troubles by the code of the west ~ simple and free of moral ambiguity. But the real world is a far more complicated than the movies, and there are lots of lessons to learn out on the trail. The Majestic Kid hits the road August 10th thru September 8th. Main Street Theatre Works is a professionally oriented theatre company, performing in the heart of Amador County. Now in their 18h season, MSTW continues to be dedicated to bringing professional and community theatre artists together to produce classical and contemporary plays, striving for a balance that stimulates both artists and audiences. Performances are Friday and Saturday nights, with gates opening at 6:30, show starting at 8:00. Patrons are encouraged to come early with picnics, chairs and jackets. The Kennedy Mine Amphitheatre is located on North Main Street in Jackson, next to the Country Squire Motel. The 45-member Amador County Concert Band, under the direction of Steve Chambers and Irv Gidding, is hosting a free concert entitled “August Music Extravaganza” and will feature a special tribute to Henry Mancini. Other selections will include Holst’s “Second Suite in F”, “A Festival Prelude” by Alfred Reed, Sousa’s “Glory of the Yankee Navy” and more. Refreshments will follow. The concert will be held Sunday, August 5 at the Community Church of Pine Grove, 14045 Ponderosa Way (off Ridge Rd. ), Pine Grove. Music will begin promptly at 3pm, so please arrive a few minutes early for this wonderful music event! The Amador County Concert Band proudly represented Northern California in June 2010, when it was selected to perform in Washington D.C. for the National Community Concert Band Sousa Festival, a salute to the legendary march king, John Philip Sousa. Under musical director Ernie Kapphahn, the band gained very high recognition for its performance and since the band’s return, has gained new members, some traveling from as far away as Sonora and Placerville. 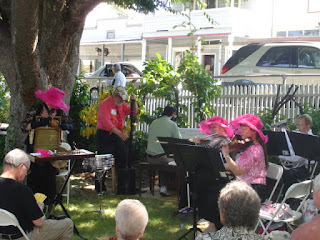 The band participated in the Golden Gate Park Band Festival in 2011 and this year performed at the Carmichael Park Community Band Festival in June. Please join us on August 5! For more information about the Amador County Concert Band regarding concerts or membership, visit our website at www.accband.org. Music by the Tri-Tone Subs and the Patrons of the Arts Awards will be featured at the finale of AmadorArts T.G.I.F. concert series on August 10. Explore the vineyard beauty of Shenandoah Valley on your way to the FREE event which will be at the Terra d’Oro Winery starting at 6:00 pm. Bring your lawn chairs or blankets and picnics. This will be your last chance of the summer to take in a free T.G.I.F. concert. To present all nine free concerts this year, AmadorArts received a generous sponsorship from Jackson Rancheria Casino and Hotel. The Tri-Tone Subs are Barry Duncan, familiar to many, on saxophones and flute and Joe Bellamy on keyboard. Performing a wide range of popular jazz, including standards, ballads, Latin and bop, they are talented improvisers making each of their concerts a unique experience. Barry Duncan has been pleasing audiences throughout northern California for over 35 years. His instrumental skills, imagination and huge repertoire make him one of Amador County’s most visible and versatile musicians. He also performs with The Sierra Sax and Brass Quartet, Carpe Duo, Groove Union, and Bad Habits. Joe Bellamy has been playing piano since age two, and he is also well known as a bassist and recording engineer. He can also be heard locally with groups such as Over the Edge, Ten Gallon Heart, and Tangled Roots. Also on tap for this evening will be the presentation of the annual Patrons of the Arts Awards by members of the Board of Directors of AmadorArts. The honor is based on an individual’s or a group’s work this past year in support of championing the arts in Amador County. Last year in 2011, the awards were bestowed to Millie Butler, art teacher at Argonaut High and advocate for more arts education, and to Adam Gottstein, writer, musician, and advocate for assisting low income youth with music training. In Plymouth, from Highway 49, turn onto Fiddletown/Shenandoah Road. Proceed a quarter mile to where the road splits. Bear to the left and continue out towards the Shenandoah Valley. Less than two miles, turn right on Shenandoah School Road. Terra d’Oro Winery is two miles out on the right side at 20680. There’s plenty of free parking. T.G.I.F. may be ending, but the fun continues on. Save the date of Thursday, August 23, 6:00 pm, when AmadorArts will hold one its popular Arts Networking Mixers. This one, with a dance theme, will be at Clark’s Corner in Ione. 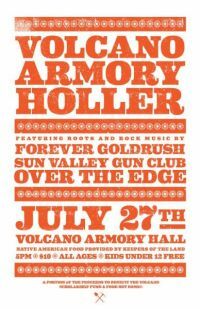 Over the Edge throws in with "Forever Goldrush" (Damon Wyckoff, singer, songwriter, excellent band) and "The Sun Valley Gun Club" for the first ever Armory Holler. This is a family friendly, multi-band format starting at 5 PM. Proceeds to benefit the Volcano Community Association Youth Scholarship Fund and Food Not Bombs. The music however will be bomb-a-licious! Cover charge $10.00 adults. Kids under 12 are free. Food (think fry bread, tacos and enchiladas), beer, soda and wine will be available. Indie acoustic folk from Australia! Sutter Creek TheaterCelebrating the release of their new album, "Before I Set Sail. "With her quirky and original tunes, Rosie Burgess and her band are captivating audiences wherever she goes. She brings both her love of music, and her engaging sense of humor to the stage, securing a growing fan base of acoustic roots and folk lovers around the globe. 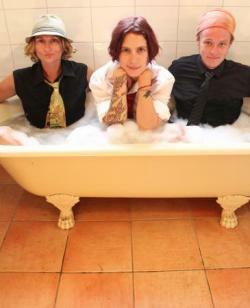 Sometimes it’s hard to fit people into boxes, and the music being produced by The Rosie Burgess Trio is no exception. Sliding from folk to blues to gypsy-roots and back, the trio cross more genres than state borders, giving off “more energy than an illegally sparked firecracker” [Drum Media, Sydney], while still maintaining their unmistakable flavor. FREE in Sutter Creek, Saturday, August 18th from 11 am to 9 pm. At the Sutter Creek Inn, 75 Main Street. The always (and in all ways) free 10th Annual International Jug Band Festival returns to Sutter Creek on August 18th. The “International” part was, of course, pure puffery, until, that is, an amazing jug band from Japan showed up. If you bill it, they will come. Jug band music has, for over a hundred years, served as an incubator for blues, for ragtime and for jazz and, more recently, for modern folk-rock music. Perhaps jug band music stretches back centuries into African music – the West African banjar and the gourd being played together may be the possible inspiration for the first jug bands we know of, who appeared on the Louisville docks in the 1890s. Those old time jug bands were formed by folks who couldn’t afford a lot of expensive normal musical instruments; they picked up empty whisky jugs, washboards, washtubs rigged up with broomsticks and clothes line for improvised basses, spoons and bones, saws played with a discarded fiddle bow, comb and tissue paper which evolved into kazoos – in other words, they made music with abnormal instruments. • Bird & Turtle Jug Band - Sutter Creek, CA – Bird & Turtle duet ( Banjo Andy and Oliah) are joined by Wayne on jug. • Willie Norton – Ione, CA – The Foothills’ own blues master brings his unique style to the party. • Brokin' Jug Band – Fiddletown – Broken and a little bent this jug duet (Forest on guitar and vocal and Wayne on jug and vocal) comes out blazing. There's sure to be a surprise guest or two. • Bakersfield Dozen - San Francisco, CA – Street corner buskers by the Bay bring their infectious good times to the Foothills. 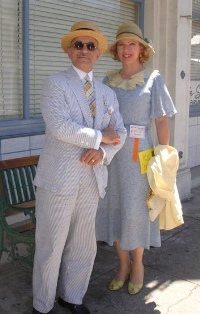 • The Neighbors – Oakland, CA – A little bit of Jazz, some Old-Time, and a whole lot of fun. Yes, they really are neighbors (most of them anyway). • The Mighty Jugamites Mento Band – Jackson, CA – And now for something a little different. Jamaican rhythms on home made instruments. Jug Band stylin' Jamaica style. • Babar Jug Band - San Francisco, CA – Who has played every single one of the Sutter Creek festivals? The legendary Babar Jug Band! It wouldn't be a festival without them. • The Jug Stompers - Gardnerville, NV – Coming back to the Sutter Creek Festival stage Mark and his sake jug along with his friends always pleases and amazes. • South Sac Jooks – Sacramento, CA – The surprise hit of last years show this unique trio merges generations into high energy jug band frivolity. • Yo' Pitzy Jug Band - Santa Barbera, CA – The Richardson Brothers combine traditional music with original tunes to create a true musical adventure. 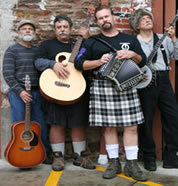 • Quake City Jug Band - East Bay – They were here for the first few festivals, now they're back. Quake City is just pure musical fun! • The Amazing Dr. Zarcon's Breathing Machine – This long time collaboration is coming to Sutter Creek with members from the Midwest and East Coast joining the Bay Area core. Get ready to be Amazed! • and finally, cap it all off with the infamous Jug Band Jam - til the cows come home. This humble, intimate small town festival has, utterly unexpectedly, set off the fourth great national revival of jug band music, the prior three epochs being jug band music’s springing from its African roots in the early 1900s, with the Mississippi and Ohio Valley show boats and race tracks as venues; the late 1920s as the spring board for some earliest recording hits by a host of great black blues artists and proto-jazz bands; and then the 1960s as a launch pad for such folk/acid/rock bands as the Grateful Dead and the Rolling Stones and musicians like John Sebastian, Jim Kweskin and Maria Muldaur. The current revival has brought together old time jug bands from all over, including some of those 1960s stars, along with highly talented new blood from the current folk/punk/hipster scene. Along with the Jugfest, fine traditional American Folk Art and Crafts will be displayed under the trees surrounding the historic 1859 Sutter Creek Inn, a fitting complement to what is probably the oldest continuing American musical genre. Built by John Keyes in 1859, the Inn is doubly historic: it was established as the West’s first bed and breakfast by Jane Way in the 1960s. This a juried, crafts fair and we are looking forward to its return. There will be a children’s workshop in the Junk Yard Play Space from 1:30 to 5:30. Bryn & Megan of Liquor Cake will help young and old make and play your own instruments from found objects and household items and, with Rick and Heidi of 5 Cent Coffee, make a diddley-bow and a homemade kazoo. It’s a big, fun, entertaining (and even educational) musical celebration, so you’re invited to come early and stay late. 10th Annual International Jug Band Festival and American Folk Art and Crafts Fair – Saturday, August 18th, 11 am to 9 pm. FREE in Sutter Creek, at the Sutter Creek Inn, 75 Main Street. This year's long running festival brings together 11 amazing jug bands, new and old, with an American Folk Art and Crafts Fair. Instrument builder/music teachers will show kids how to make and play simple instruments and then have them up on stage with the bands. Information at http://www.jugfest.org/ or Banjo Andy 209 267-5967. Family and Friends: An incredible event with some remaining tickets available will be taking place on Saturday, July 28th celebrating the 2nd Annual Tanner Vineyards Release Party. This event will be hosted by the Black Bear Inn in Arnold on Hwy 4. Chef Bruce has meticulously crafted a scrumptious menu and a spectacular variety of Tanner Wines will be paired (trio’d??) with Chef Bruce’s edible delights and the music of Over the Edge. This one of the many reasons why living in California is sooooo good. More information for this event can be found here: http://us2.campaign-archive1.com/?u=b9026fd8cebd076c5eee0e2b1&id=479f205de0&e=f30abbe2da Reserve now and we will see you there! AmadorArts, a non-profit, seeks an Executive Director, part-time, 20 hrs/week to start; potential to be full-time. $18 - $25/hr dependent on experience and qualifications. Ideal candidate will have strong leadership and management skills, ability to work independently on multiple tasks. Good organizational skills essential. 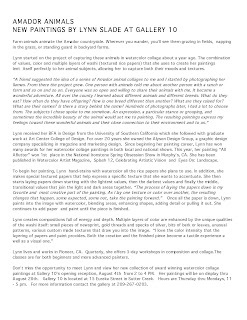 For complete details: http://www.amadorarts.org/ Deadline: Aug. 31. No calls, please. The next Amador 1st Saturday Art Trek will be August 4, from 1:00 to 7:00 pm at nine galleries in Amador County and the north part of Calaveras. Take a trek and see what each gallery is currently featuring. It might be an artist's reception, cookies and punch, wine and cheese, music, or simply staying open for an extra hour or two on this 1st Saturday evening. You’ll always have fun seeing what kind of art these galleries have selected to exhibit for the month and meeting others, like artists and art lovers. A showing of powerful mezzotints by San Francisco artist James Groleau will be highlighted at an Amador 1st Saturday Art trek reception on August 4th from 4 - 7pm at the Hanford St. Gallery in Sutter Creek. The 11 images that make up the body of work titled "Gates of Rochefort" are not editioned prints, but one-of-a-kind pieces. Depictions of various French architectural elements were first rendered in mezzotint, then cut up and sewn together to form two-dimensional structures. The structures were then hand-stitched onto property deeds from Rochefort, France. Materials include mezzotint, thread, glue, charcoal and antique deeds dating to 1836. Groleau taught himself this most difficult printmaking technique and has become a modern master at it. He is the recipient of numerous awards, grants, and fellowships, and his work in the collections of National Museum of Fine Art, Antwerp, Belgium; the Oakland Museum; Cleveland Museum, and in many others. At Chaos Glassworks in Sutter Creek, view the exhibit of photographs by life-long Amador County photographer Larry Angier, featuring select black and white and color photographs of Amador County and the west. His work has won awards internationally including Silver and Bronze awards in the 2012 Epson International Panorama Competition. 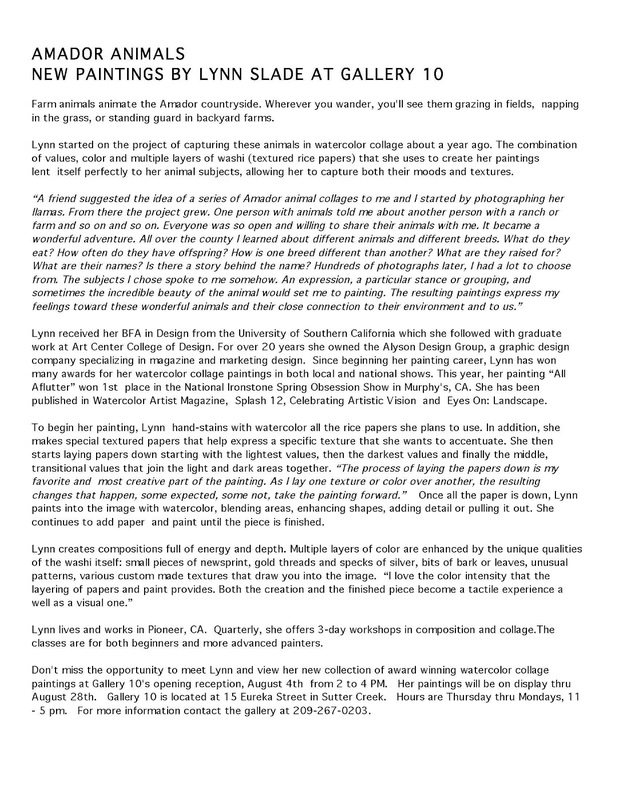 Additionally, his work was juried into the California Works exhibition at the 2012 California State Fair. The Amador Council of Tourism uses Angier's work in their travel planners and on their website. Little City Studio & Gallery in Amador City is now featuring beautiful stoneware pottery by local artist Joyce Theurkauf. 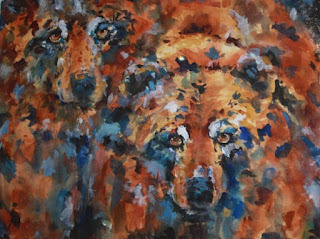 August is a little uncertain for the owner / artist Carol Sethre. She advises calling first, 209-267-9257. 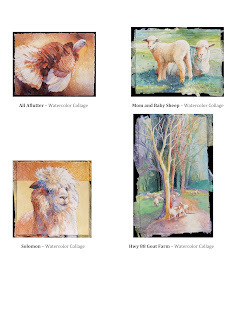 Featured Artist at Sutter Creek Gallery in August is Melissa Doyel, a watercolorist from Fiddletown. This artist Co-Op gallery will be open in her honor on this 1st Saturday Art Trek 1:00 until 7:00 pm. Come by and meet the artist. Melissa Doyel has drawn or painted most of her life. Not formally trained, but with a love of watercolor, she’s been focused on the medium since moving to Amador four years ago. She’s learned technique and how to explore new ideas from several local teachers and artists. Doyel has received multiple 1st & 2nd place awards in the Amador County Fair each year and won Best Of Show for her watercolor portrait “ Tyler” in 2011. 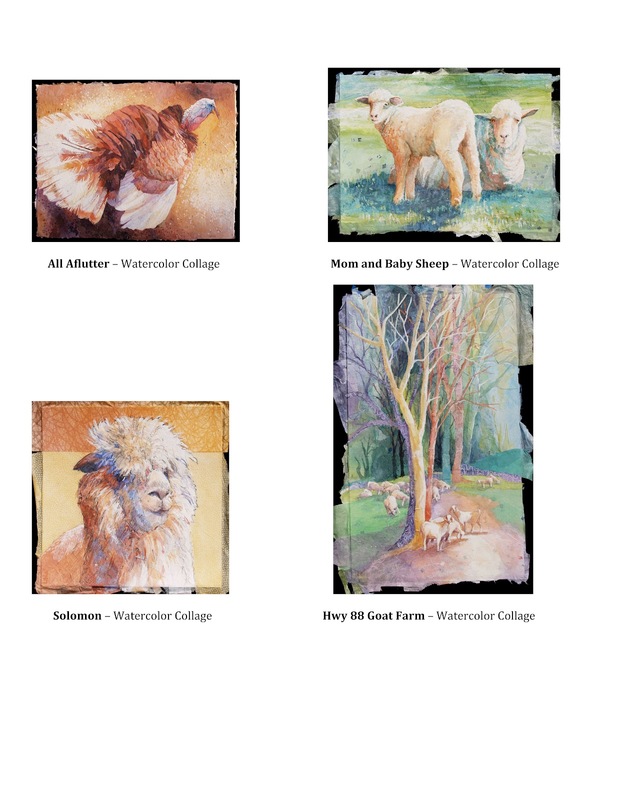 The Sutter Creek Gallery hosts several different mediums of art including watercolor, oils, textiles, photograhy, sculpture & more. Fine Eye Gallery will continue to feature artisans Ugone & Thomas. These incomparable designers pioneered an affordable giclee process that maintains the unique, luminous look and feel of their signature lampshades. You can see the works of Janna Ugone and Justin Thomas and their full line of giclee lamps and home accessories as well as custom-order their original hand painted lighting. Little City Studio & Gallery with all local artists - both fine art and accessories - you are sure to find something to delight. 14180 Main St., Amador City, CA 95601. Valley View Interiors brings a discriminating taste in carefully chosen works of fine art. A strong eye for detail and a smart sense of style create a welcoming retreat. 48 Main St., Sutter Creek, CA 95685. One of the 11 images by James Groleau that can be seen at Hanford St. Gallery. 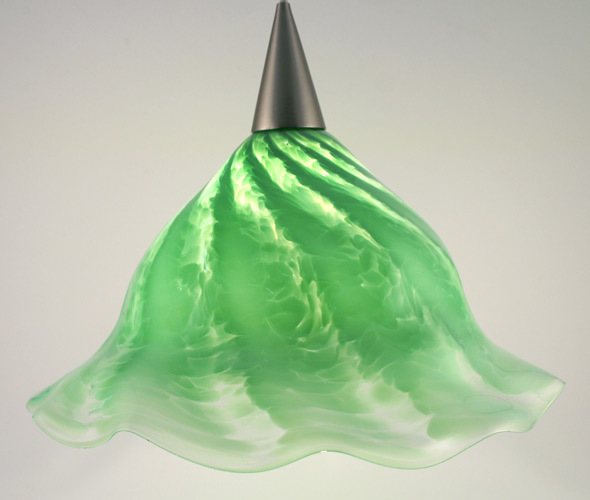 You can always find one-of-a-kind glass art, like this light, in Chaos Glassworks. Described as a Mixer for the Arts, guests mingle while enjoying the themed-event, this time featuring Dance. Complimentary appetizers and a no-host wine bar make coming to an Arts Networking mixer a friendly, fun, and casual experience. A raffle of original art is another plus.Featured will be demonstrations in contemporary, tap, and hip-hop by students of The Studio Performing Technique Dance School. The Studio operates its classes and training at a state-of-the-art facility in Martell and attracts all ages of locals who love to be physically fit and express themselves through dance. The next Arts Networking Open House will be a “Holiday” theme on November 29, in Sutter Creek at BellaGrace Vineyards Tasting Room. Their wines were just awarded honors of “Best of California” at the 2012 California State Fair. Featured artist will be Anje Olmstead. Visit www.amadorarts.org for more information. 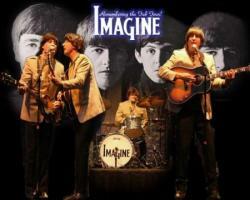 This Beatles Tribute band is all about remembering the Fab Four. From their boots, their vintage clothing and their accents and Beatles wit, Imagine has captured the essence of the Beatles. Since putting the band together in 1993, these talented musicians have performed in more than 800 shows across the United States and abroad. 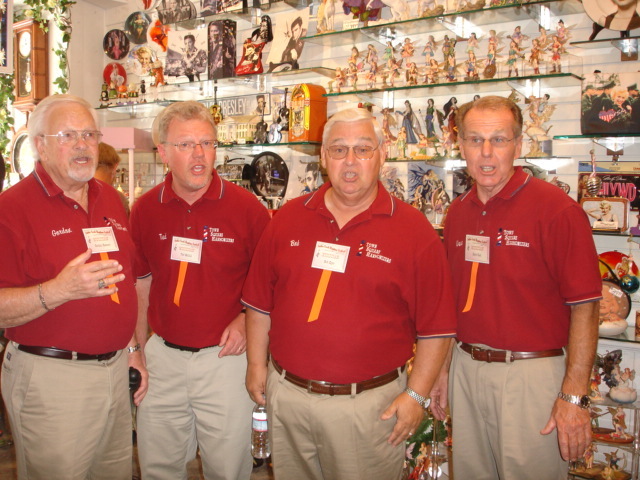 Over the years the group has had the privilege of sharing the stage with such notable acts as the Beach Boys, Jay Leno, Chicago, Temptations, Badfinger, America, Glen Campbell, the Mandrells, the Shirelles, and the Buckinghams. Among their many highlights would include performing at the Nokia Sugarbowl in New Orleans for a national TV audience, being the first act to ever perform at the 20,000 seat USANA amphitheater in Salt Lake City, Utah and their 21 shows at the Shanghai Music Festival in May 2005. Have you ever wondered what music teenagers of a century ago were listening to that drove their parent’s wild? Well, we have the answer. 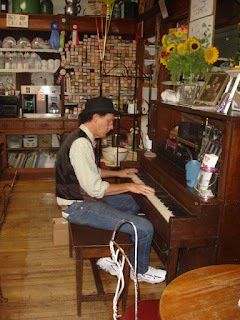 It was Ragtime and to catch that “feel young again” spirit, come and enjoy the 14th Annual Sutter Creek Ragtime Festival, to be held August 10-12, 2012. Sutter Creek will be jumping again with sparkling solo sets, the festival extravaganza concerts, mixed sets featuring the talents of several festival artists, plus all the hilarity and good music spilling on into the After Hours sessions where there is always a surprise player or two. Do you enjoy silent movies on the silver screen? Well, we’ve got Frederic Hodges and Keith Taylor scheduled for a Silent Movie Night. How about Gala Festival Concerts? Well, two of those are also planned that feature festival headliners. A Future of Ragtime Concert is also planned presenting some pretty serious youth performers. Add in five, practically nonstop venues of solo, duos and groups all presenting the many moods of ragtime and you’ve got a festival not to be missed. There is even a pre-festival gathering “Wine and Nibbles” at Skunk Hollow, the Victorian home of Chip Lusby, 50 Gold Dust Trail in Sutter Creek. The list of invited performers includes Patrick Aranda, The Bradshaws, Tom Brier, Crown Syncopators, Marty Eggers, Frederick Hodges, Vincent Johnson, Carl "Sonny" Leyland, Larisa Migachyov, Will Perkins, Stevens Price, Ragtime Skedaddlers, Ragnolia Ragtette, Raspberry Jam Band, John Remmers, Tim Rotolo, Ray Skjelbred, Squeek Steele, Paul Stewart, Monty Suffern, Sullivans & Drivons, Keith Taylor, Virginia Tichenor, John Reed-Torres and more. You won’t want to miss a note. All-Events badges, which include the two special concerts and Silent Movie Night, are now on sale for the Early Bird Price of $60, if ordered by July 15, 2012. The price increases to $70 after that. Youth 16 and under attend free with a paying adult. ($20 service charge for refunds requested prior to 7/15; no refunds after 7/15.) Day badges and individual concert tickets will also be available. Badge order forms may be found at http://www.suttercreekragtime.com/. For more information call: (209) 405-1563 or e-mail: motherloderagtime@comcast.net. A showing of remarkable mezzotints by San Francisco artist James Groleau. Groleau was born in Lewiston, Maine in 1960. A self-taught artist usually drawn to dark, psychological themes, Groleau extends his focus in the "Salt Granite Spruce " series to encompass the beauty of his native state. Intimations of the early twentieth century Arts and Crafts Movement are evident in the palette of greens and grays, with additional touches of violet, eggplant and ochre. Salt Granite Spruce" is a series of eighteen color mezzotints depicting coastal Maine. A variety of techniques were used in the production of this series and are common to each image. Chine collé utilizes color paper in the print and offers a consistent underlying tone. A mustard-colored paper was glued to the larger printing paper during the printing process. The images were created through the use of four mezzotint plates, each plate introducing an additional color and dimension. Selected plates were prepared a la poupée, which involves inking one plate with two or more color inks. Each image measures roughly five inches by twelve inches and was printed in an edition of fifty. Groleau taught himself this most difficult printmaking technique and has become a modern master at it. He is the recipient of numerous awards, grants, and fellowships, including a MacDowell Colony fellowship in 2001. His work is included in the collections of the Achenbach Foundation for Graphic Arts, Fine Arts Museums of San Francisco; Portland Museum of Art, Portland, ME; Cleveland Museum of Art, Cleveland, OH; Oakland Museum of California; National Museum of Fine Art, Antwerp, Belgium; and the Janet Turner Print Museum, Chico, CA. He divides his time between San Francisco and coastal Maine. The exhibit will run through July 29th. Hanford St. Gallery is located at 291 Hanford St., Old Hwy 49 (next to the Days Inn), in Sutter Creek, CA, and is open Thu/Fri/Sat 10 - 5 and Sunday 11 -4:30. For more information call 209-267-8074 or email hanfordstgallery@volcano.net. The Feather River Band will return to Amador when the green grass and babbling waters of Minnie Provis Park in Sutter Creek beckons picnickers for another enjoyable evening. The free music starts at 6:00 pm on July 20. Bring your own dinners, beverages, and items to sit on. Rodger Faddis and Danny McCauley comprise Feather River and their music reflects their fondness of the country western style with a western swing flavor. They met in a work environment and quickly discovered they both had a love of the same kind of music. Faddis plays rhythm guitar and provides vocals, while McCauley plays pedal steel guitar leads and sings backup. Audiences love the easy, smooth and upbeat sound. They’ve played at many local events, including at the Italian Picnic Grounds, Teresa’s Place, BG’s Lounge, Dandelion Days, Blue Mountain Event Center, private parties and other events. From old Highway 49 in Sutter Creek, turn onto Church Street to find the park, a half block down on the left. There will not be a T.G.I.F concert on July 27 because the Amador County Fair in Plymouth will be going on in full swing with its theme of “Barn in the USA.” Be sure to attend; there’s lots of music and other fun things to do and see, like the Friday night Wine Tasting for an additional fee, the Professional Art & Photography Exhibit, and the window that spotlights activities of AmadorArts. Black Irish Band Heads to Pioneer for free T.G.I.F. Concert August 3The renowned Black Irish Band, who hail from Tuolumne County but who’ve been around the world sharing their special music, will be presented by AmadorArts in a T.G.I.F. free concert on Friday, August 3 starting at 6:00 pm. Mollie Joyce Park in Pioneer will be the venue for this performance. No outside beverages will be allowed at this park, but picnics are welcome. Bring your folding chairs. When you take Celtic, Spanish, and Italian music, and mix it up, you get the true nature of the Black Irish. For 22 years this band has created an original sound that no other band has. They’re way more than Celtic performing traditional maritime and railroad music that capture the spirit of the immigrants of this country. Food and beverages will be available at Mollie Joyce Park, which is reached by heading east on Highway 88. In Pioneer, turn left onto Carson Drive, follow the park signs to the entrance.